Part of the idea behind the cartoon is to convey the concept that plants are the lungs of the world, liberating oxygen from carbon dioxide via photosynthesis. PArt of the idea behind the illustration is to convey the concept that trees are the lungs of the world. 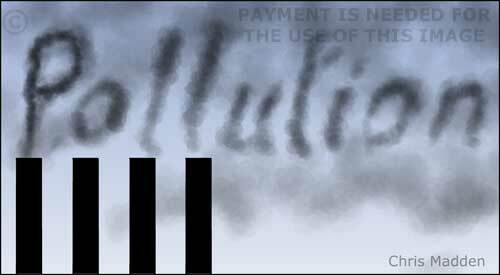 A cartoon showing pollutants in the form of polluting black smoke issuing from a factory chimney. A cartoon about environment-friendly materials. A discarded polystyrene container talking to animals, saying that it likes nature so much that it’s decided to stay around for a long time. 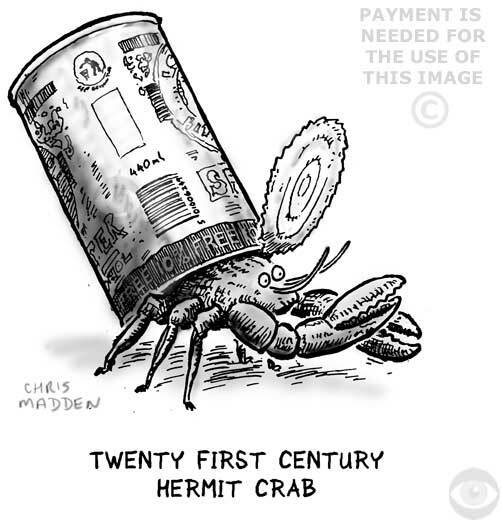 Cartoon showing a plant growing in a canister of toxic waste. The flower has the earth as its centre, with its petals in the form of people. The petals are falling off as the flower dies. A previous version of this cartoon appeared in New Internationalist magazine some time in the 1980s. Cartoon about taste, both gastronomic and aesthetic. Showing that values and tastes that people (or rats) possess are dependant on circumstances, context and so on, and are not fixed or absolute. 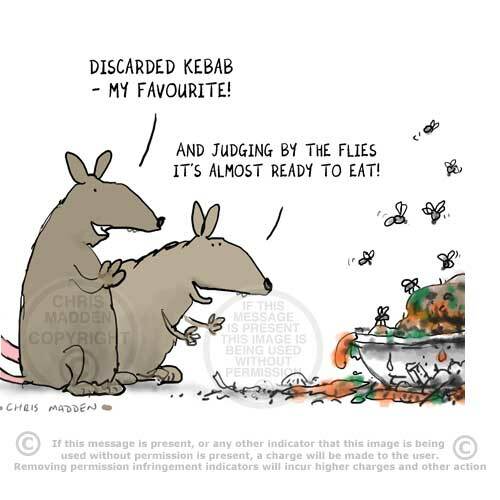 Cartoon showing rats looking at a discarded, decaying, rotting piece of food covered with flies and thinking that it looks delicious and attractive. In such circumstances we as humans would be subject to the gag reflex or wretch reaction. 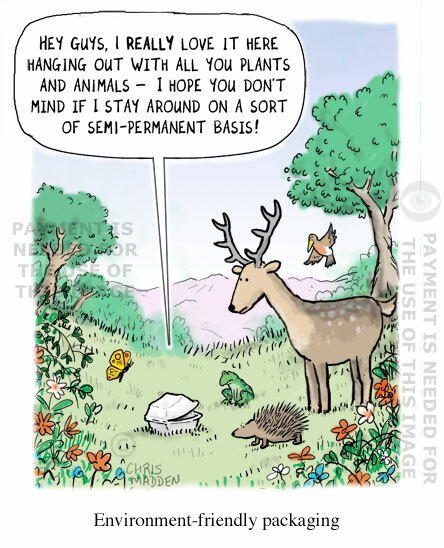 The cartoon is inspired by the book Silent Spring by Rachel Carson. The carbon footprint of the west compared to the carbon footprint of the developing world. The west’s is much bigger. 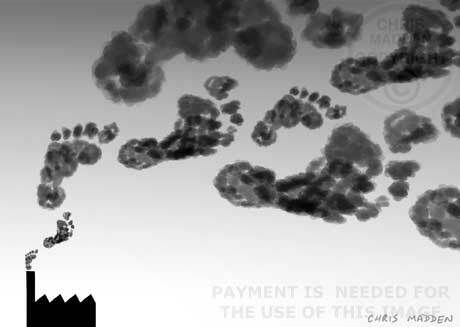 The carbon footprint of the developed world is shown as a huge boot print, while the carbon foot print of the developing world is shown as a tiny foot print (a bare footprint in fact). This is to illustrate the fact that the west has a much larger impact on carbon levels than the developing world. 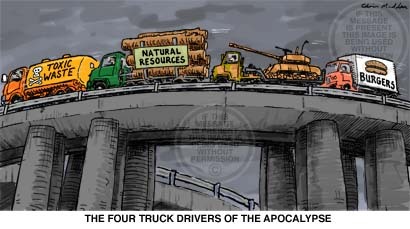 The Four Truck Drivers of the Apocalyse. The cartoon shows lorries carrying cargoes that are symbolic of the ills of contemporary western society (with other societies fast catching up). A disused quarry being used as a landfill dump for waste products. A cartoon about environmental impact, indigenous peoples, exploitation, ecological impact, ecology,recycling, waste disposal, waste management. A cartoon about environment-friendly materials. A discarded polystyrene container talking to animals, saying that it likes nature so much that it’s decided to stay around for a long time. A catoon about evolution, pollution, environment, ecology, industrial waste, effluent. How to breathe clean air in a polluted atmosphere (by using oxygen generated by trees and other plants. 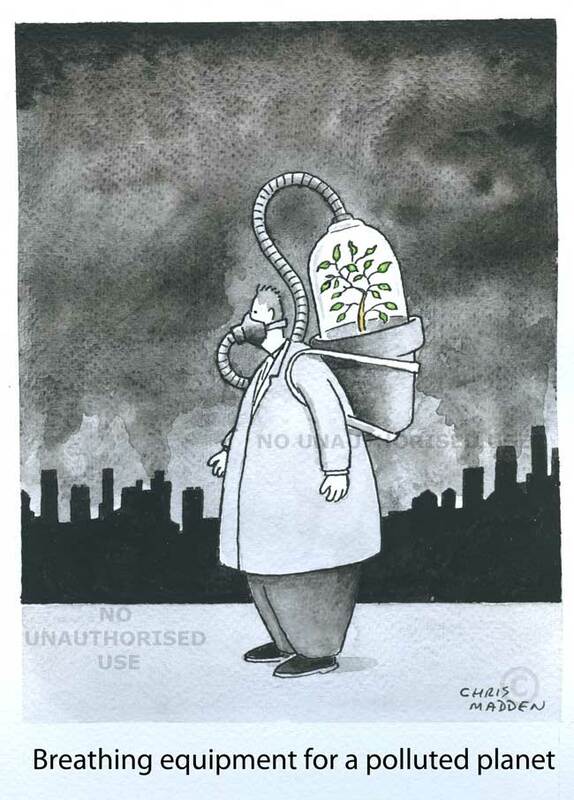 A cartoon about pollution, clear air, trees as lungs of the world.